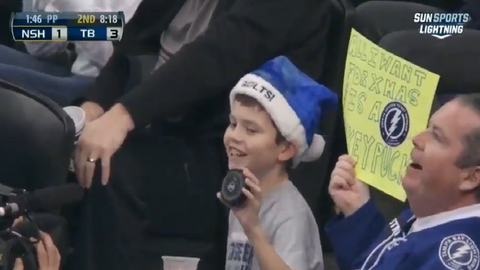 A young boy attended the Tampa Bay Lightning game Thursday night with one goal in mind: Leave with a puck. Thanks to a good Samaritan nearby, he received his wish in the name of some holiday cheer. This is the time of year for giving, and Tampa Bay Times Forum was the site of a selfless act worth saluting. In the second period of the Lightning’s 4-2 victory over the Nashville Predators, a power-play shot by the visitors ricocheted over the glass, into the front row. A Bolts fan, after snagging the prize, stood from his seat and lifted the puck in his right hand to the approval of others close by. Turns out, the puck had yet to reach its final destination. What happened next made a boy’s night and allowed Christmas to come early. The fan noticed the boy’s humble yellow sign — it read, "ALL I WANT FOR XMAS IS A HOCKEY PUCK" — and handed the gift to the grinning recipient. The boy waved his present with pride. There were smiles. There was applause. There was satisfaction in a deed well done. Sometimes, giving is the greatest gift.